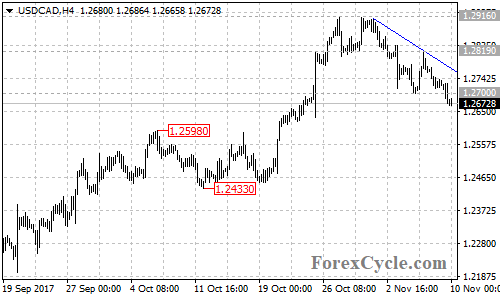 USDCAD broke below 1.2700 support and extended its downside movement from 1.2916 to as low as 1.2666, facing the support of the bullish trend line on the daily chart. Near term resistance is at the falling trend line on the 4-hour chart. As long as the price is below this trend line, the downtrend could be expected to continue and next target would be at 1.2500 area. On the upside, a clear break above the falling trend line could bring price back to next resistance level at 1.2819. Above this level will confirm that the downtrend is complete, then next target would be at 1.2916, followed by 1.3100.